Walking through the cloister of the old Hospital of the Holy Cross, we came across the hospital's Pharmacy, the original one of 1417 the oldest in Europe, and currently the headquarters of the Royal Academy of Pharmacy of Catalonia, which carefully preserves the furniture, the original ceramic containers and the window of 1696, used to deliver the medicines. Do not miss the opportunity to know this hidden corner. Languages: Catalan, Spanish & English. To attend the "Guided Tours to the RAFC" will have to make the reservation and the payment. 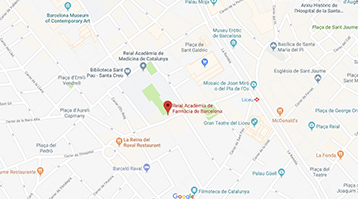 They can give other people Guided visits to the Royal Academy of Pharmacy of Catalonia, gifts can choose the day they wish to enjoy the experience within the dates of the activity.